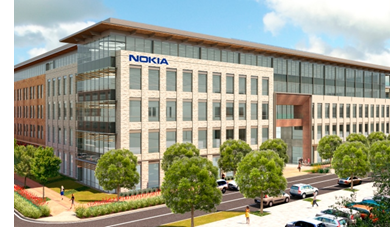 ​​​​ ​IRVING – Nokia signed a lease for 350,000 sf in The Sound at Cypress Waters to consolidate DFW operations and relocate its North American headquarters. Nokia will occupy two buildings in the new lakefront mixed-use development located along the 362-acre North Lake. Specifically, the company will occupy 100,000 sf at 3100 Olympus Blvd., and 250,000 sf at 3201 Olympus Blvd. Nokia’s target date for completion of the consolidation is early third quarter 2019. At completion, Cypress Waters’ 1,000 acres will become a high-density community of up to 8.5 million sf of office space, 450,000 sf of retail space, more than 10,000 residences, and three schools.